Much like Facebook, Etsy seems to always be changing. Just when you get used to how things look or how they work, things get remodeled. I'll admit - I'm a creature of habit and my hand moves the mouse and the cursor/pointer to places on the screen pretty much on auto pilot. It was a bit startling to go to Etsy's website and find some changes. Your Etsy is now named Your Account and it's located on the right instead of the left side of the home page. To look at your Etsy shop, you have to click on a graphic that is supposed to look like a storefront. Don't get me wrong...I'm not expecting Etsy to stay the same forever. It's nice to know they continue to grow and change to meet the needs of Etsy sellers and their customers. My problem with Etsy's changes (and Facebook's) is that they seem to happen too often. Why can't they iron out the kinks and save up the changes for a renovation only once per year? Etsy has reshuffled the locations of things on the front page several times in the year I've had an account there. What else has changed in the last year? Since I was ill this week and had to catch up on tutoring students, this feature is going to be short and sweet. Pretty much everyone in the tatting universe knows Jane Eborall. She lives in England and has been tatting for more than 54 years and designing tatting patterns for at least 25 years. Even though she plays with other handicrafts, tatting always seems to win out. Her blog, Tatting and Not a Lot Else, has been her outlet for sharing patterns, telling stories, and showing off her latest creations. I found this wonderful interview that Noreeen Crone-Findlay did a couple of years ago with Jane. Jane's shop on Etsy is a delightful collection of colorful tatted creations as well as sewn pouches for carrying tatting supplies. 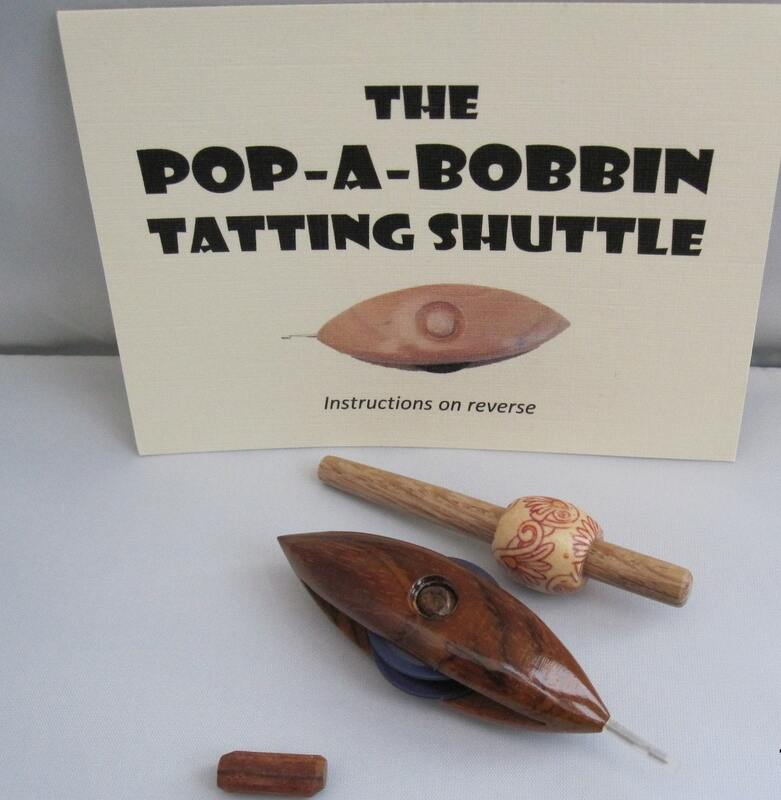 Periodically, she has some wonderful Pop-A-Bobbin shuttles in her shop, crafted from the most beautiful wood by her sister (Sally) and her husband. Those shuttles sell out almost as soon as they are listed! I bought one last year, but I haven't used it yet since it seems more like a work of art than a tool. Thursday Thoughts - How important is it to match? As a child, my mom taught me how to match my clothing so I would look good and the other kids wouldn't laugh at me. I learned stuff like "both your socks should match" and "don't wear prints with other prints." Somehow, I missed the memo that said those rules don't apply anymore. I didn't mind when people were dabbling in mismatched earrings since it didn't seem so weird. Where it crosses the line is wearing stripes with dots or mixing colors that weren't supposed to go together. It's not just on the fashion runways...I've seen it in real life. 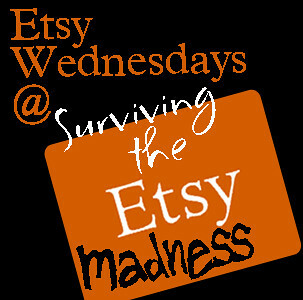 Welcome to ETSY WEDNESDAY! When I first started my business and this blog, some of the biggest help I got in getting business exposure and blog traffic came from sites like Suzy's Artsy Craftsy Sitcom that were hosting Linky Parties. I believe there's no better way for me to help you survive the Etsy madness than to let you show off your own Etsy shop. Don't worry, you can still link up even if you're on Artfire, 1000 Markets, Folksy, etc. Being in a never-ending crafting mode leads to some fun results. Rather than waste new materials and supplies, we usually goof around with whatever we can find around the house. Call it upcycled, recycled, or repurposed, there's so much you can do with packaging instead of throwing it away. Since February is the month of love, I thought I'd show you some of the things we made that represent some things we love. Spam! I never tried Spam until I got married and now I'm hooked. I cut up the can and folded the edges under (with pliers) so they wouldn't be sharp. Then I coated it with Mod Podge Dimensional Magic. Once it was dry, I glued a pinback to it. I'm actually pretty proud of this bit of geekery. Tatting Tuesday - Are Dimpled Rings Supposed to Be This Difficult? In trying to get a jump on some items for St. Patrick's Day, I decided to try my hand at making some shamrocks. I found this pattern for a key chain shamrock by Cristina Banyard. The pattern has three dimpled rings forming the shamrock and it was my first experience in making dimpled rings. I used a variegated green Omega rayon thread for the project and it may be the thread that made the experience a tough one. The Omega thread often twists up, leading to snags when closing the ring. I'm trying to set up some regular posting categories to keep myself organized. You've already seen Etsy Wednesday and Feature Friday postings from me over the past couple of weeks. Welcome to Monday Madness! I like this one because I can have a flare for madness. Since Christmas, I've only had one sale in my Etsy shop and I've been feeling the need to do something about it. The first priority has been making some new items to list in the shop. I was able to get three new tatted items listed in the shop today. Two of them are an attempt to blend my husband's Navajo culture with my tatting. I used a bright turquoise Omega rayon thread and added silver colored seed beads to give it a Southwestern flair. The bracelet is based on the same pattern I made up for the blue button bracelet I made last week. Instead of a button closure, I used a turquoise stone. The turquoise and silver together look really great and it will be hard to let this one leave my hands. For today's Feature Friday, I decided to go in a slightly different direction. I am a big believer in paying it forward, creating good karma, etc. When we help others, we make the world a better place and we are better for it. For that reason, I am featuring The Handmade Movement. What is The Handmade Movement? "The handmade movement" is the collective energy and creativity of Artists and Crafters who work with their hands. This site's purpose is to support sellers and buyers of handmade items- right now the main focus being through the "Sneak Attack". Although unaffiliated with Etsy, they focus in particular on shops of handmade items from Etsy.com. Those who know me know it's dangerous for me to get bored. I tend to start experimenting and you never know what will happen. If I experiment with cooking, it generally turns into weird concoctions and a general disaster. Fortunately, I limited my adventures to the craft arena today. 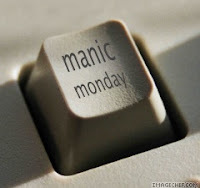 I had a bit of a manic Monday this week and I don't think it had anything to do with being Valentine's Day. It started with a great meeting (surprising, huh?). I'm on the board of the Women's Business Network of the Utah Valley Chamber of Commerce and we met to discuss how our last luncheon meeting went and our plans for future events. There's something very energizing about working with a group of women who share the same vision you do and respect you skills and abilities. That morning's meeting set the tone for a great and productive day. After coming home from work, I launched into a project to create a bracelet for a student I tutor. She saw me tatting once and asked me if tatting could be made into bracelets. I told her it could and she wanted me to maker her one. She likes to make woven friendship bracelets and offered to make one to trade for the bracelet I would make for her. Giving gifts to students is generally discouraged since it can be interpreted as favoritism, but I figured this was okay since we're trading items that showcase our skills. One of the reasons (and there are many) that I started this blog was to help increase visibility and traffic for my Etsy shop. There are lots of other people out there with blogs linked to their shops as well as those who have craft blogs just to show off the projects they make for their own homes. Getting more people to look at your "craft" blog is important whether you're selling your items or not. Crafterminds is a super group of expert craft bloggers with a mission to connect lifestyle bloggers and their loyal audiences to marketers that focus on DIY, handmade, and arts & crafts markets. I ran across them last week during their regular Monday Twitter chat. The chat was about blog design and there were a lot of great tips exchanged. Their next chat is scheduled for Monday, February 14, at 4:00 pm ET. Search for the hashtag #crafterminds to follow along. Their topic will be about increasing traffic to your craft blog. 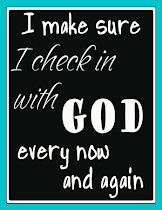 Did You Miss Your Opportunity? One of the tough lessons I'm learning with selling things online is that you have to plan far in advance when making items to sell that are geared toward a particular holiday or event. Despite having a lot of great ideas for Valentine's Day items for my shop, I only managed to get one jewelry set listed and I missed my opportunity. I should have made more for the shop a month or two ago. By the time I figured out how to make these red and black tatted hoop earrings, it was too late to have them online in time for Valentine's Day. They will still make a great addition to my shop, but I will have missed the holiday they were best suited to. You may think you're in business to sell crafts, but you're not. You're in business to make a profit. Think about it for a sec. Sure, crafts are what you sell; but would you still sell them if they cost you more than they brought in? Probably not. Craft sales are just the way you make money. Welcome to ETSY WEDNESDAY! When I first started my business and this blog, some of the biggest help I got in getting business exposure and blog traffic came from sites like Tools Are For Women Too! that were hosting Linky Parties. I believe there's no better way for me to help you survive the Etsy madness than to let you show off your own Etsy shop. Don't worry, you can still link up even if you're on Artfire, 1000 Markets, Folksy, etc. Why Is It So Important to Promote Events? 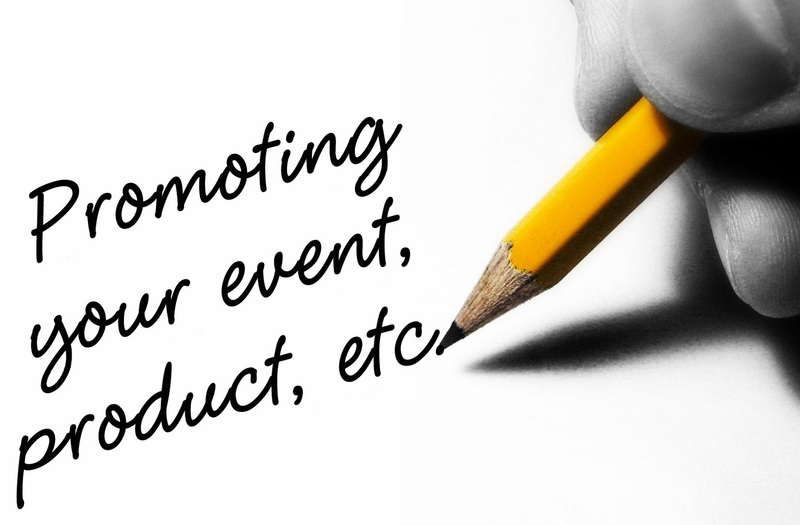 You absolutely MUST promote your events if you want anyone to show up. Don't assume people know the event is happening or that people will search out your event. Promotion is key to attendance/participation! I get the feeling sometimes that people are misunderstanding what promotion is. No matter how big or small your event is, you need to get the word out. It frustrates me to see an event with tons of potential, but extremely low attendance. This weekend was a good example of that. Blogger Appreciation Day is a monthly meme where you list the blogs that gave you the most traffic for the previous month. Go into your tracking service (ie. Google Analytics) and set the time period for January 1 to January 31. Find the sites that have referred readers to you and put them in order from most sends to lowest. Write a post (like this one) listing your top 10 referrers. Link that post at 3 Boys and a Dog (linky posted around the 5th of the month). Grab the Blogger Appreciation Day picture and add it to your site. 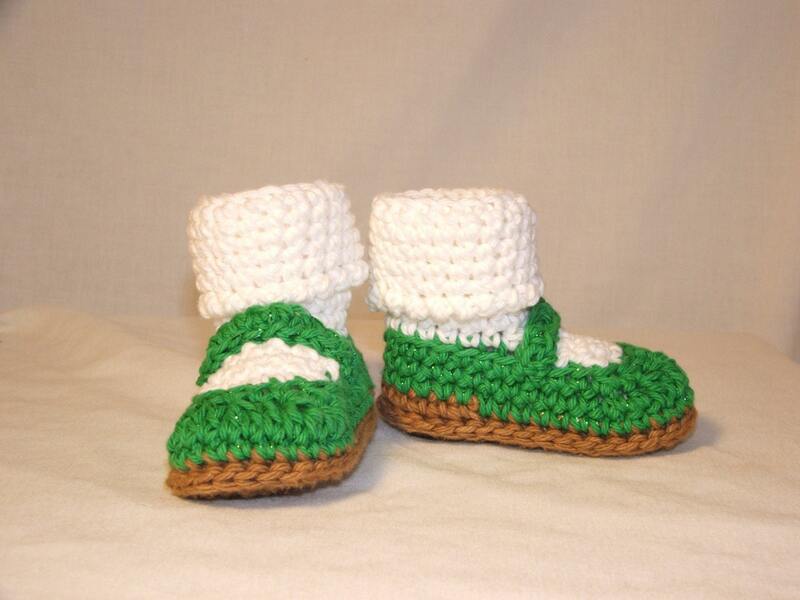 Miranda Gabrielle's Etsy shop focuses on homemade crafts and knitting. She is a high school science teacher whose obsession is knitting. Although she has tried just about any sort of craft you can imagine, knitting kept popping up in her life. 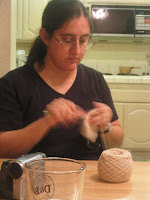 As a voracious reader, she noticed that knitting often pops up in books, whether the main character is knitting or knitting is part of the economy. She noticed people knitting out in public, in classes, on the bus, etc. and realized that it was not only a practical activity, but a social one as well. Do you love what you do? Is your work satisfying? Or does your work feel like WORK? Please don't tell me that you think it doesn't matter. If you're not enjoying your work, how can you enjoy your life? Whether it's your day job or a small business on the side, you should be doing something that makes you happy. Welcome to my first ever ETSY WEDNESDAY! When I first started my business and this blog, some of the biggest help I got in getting business exposure and blog traffic came from sites like Tools Are For Women Too! that were hosting Linky Parties. I believe there's no better way for me to help you survive the Etsy madness than to let you show off your own Etsy shop. Don't worry, you can still link up even if you're on Artfire, 1000 Markets, Folksy, etc.